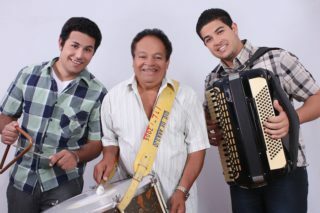 The last six years of this story bring an even greater emotion, since since then the Trio happened to be formed by Dió Araújo (zabumba and voice) and its children Felipe de Araújo (triangle) and Demétrios de Araújo (accordion). A feeling that starts at home and finds its apex on the stage. Father and children express the best of traditional Northeastern culture, seeking its renewal. It’s the old giving space the new and the new valuing the old. The Trio, which already collects some hits, is preparing to release a new CD yet in the first half of 2017. The promise is a CD full of news, with many copyrighted songs and also lots of energy. The stage chosen for the debut of this new work will be the European Continent, where traditional forró has been gaining more and more space and where Dió de Araújo had, during the year 2016, the honor of being honored by the project “Baião in Lisbon”. The trio can hardly wait to pack all to the sound of the new CD, but without forgetting those musics that always bring good memories like “Onde Está Você”, “É Só Você Querer”, “Novinho em folha”, “Medo de Amar”, “Calendário do Amor”, “Forró Agarradinho”, “Coração Maluvido” and more.